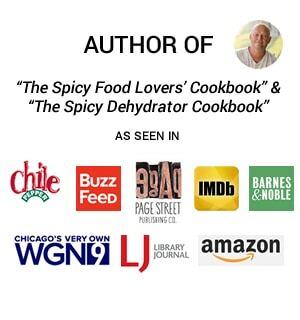 Feel free to contact Mike or Patty with any questions, whether they be about chili peppers, food, or anything else related to our web site – mike@chilipeppermadness.com. Chili Pepper Madness is a tribute to cooking creatively with zesty, bold food, and yes, that often includes chili peppers. Their visitors not only love chili peppers, but also other fresh, high-flavor foods and they want to know how to easily incorporate them into their meals. That is why we are here – Creative Cooking that is approachable, educational and fun. Ask for our Media Kit. Hi! Greetings from Nairobi Kenya! I just found your lovely website this evening! We love hot sauce. We love Chilies. We love spicy food. And we hate cooking from a can. Also, really good southwest style, or Mexican style, or Tex/Mex style hot sauces are almost impossible to find here. I’ve spent two and a half years researching how to get decent corn chips and taco shells here. 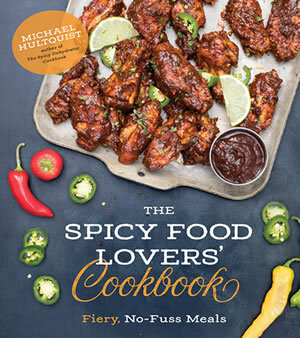 So, when my last bottle of hot sauce in the US ran out, and I ended up with a kilo of chili peppers in my kitchen (fresh ingredients are easy to find), I went looking for recipes! HURRAH!!!!!!! Your blog is perfect! And you even gave me a recipe for Queso Blanco – cheese is also expensive here, and hard to find, and I have yet to find a good rennet source. THANK-YOU!! Just in time for cooking for a Cinquo de Mayo party!!! Perfect! 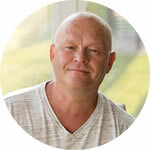 Hi Michael, been following your blog and Facebook page for a while now…love your site! I’ve tried a few of your recipes and they are amazing. 1. Can you dehydrate chillies that have been frozen? 2. For a chilli mash, can you use chillies that have been frozen? Great, Andrew! Thanks. 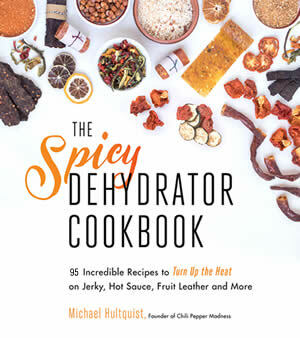 To answer – YES, you can dehydrate frozen peppers. Just thaw them first. I slice them per usual, and might dry them a bit with paper towels to draw out excessive moisture. For the mash, also YES, you can ferment from frozen peppers, but you might need to use a culture starter to get the process going. It should just work normally, though. Let me know how it all turns out for you. I just wanted to say that this website is amazing. Hands down the best for any hot sauce and spicy foods. Thank you for the great work and recipes. I fully enjoy all the sauces and enjoy learning how to make them. Thanks so much, Emily! I appreciate it! Hi Gavin,just found this site! Im in UK at present but from Cape Town.I have been a chilli freak for many years and imported seeds to SA.. 7 pot, CReaper,Trinidad scorpians and lots more.Grew fantastically in pots and yield high for making my amasing chilli sauce. I noticed your instructions for making fermented pepper mash say it can be done with dried peppers, as well as fresh. So, after a quick spin in a coffee or herb grinder, put about half what you normally would of fresh into the jars, then add enough extra brine to account for swelling? Or reconstitute first? And if so, how? I made some excellent hot sauce last year from fresh Thai peppers I fermented first using your recipes. My crop of them this year wasn’t as bountiful, so I’m hoping to make a reasonable facsimile from last year’s dehydrated ones. Sure thing, Larry. The dried peppers will reconstitute in the brine, so just make sure you have enough brine to keep everything covered. Let me know how it turns out for you. Hi Mike. Enjoy your recipes. I went “off recipe today, and even though I only added 1/2 cup of white wine vinegar, sauce is too vinegary for my taste. What can I do to salvage it please? Karen, the best way to reduce the vinegary flavor is to reprocess the sauce (sauce, right?) with more peppers, and/or also add in something that will reduce the vinegar flavor, such a a fruit juice. Let me know if that works for you. 1) I didn’t have horseradish (coudn’t find any) so just have ginger and turmeric. Missed the step of peeling them! 2) Some garlic cloves I didn’t really chop up but just threw in there (peeled and cut a little, just not chopped). They turned blue-ish at some point but are now fading a bit. Hi, Eric. Yikes! It is probably salvageable, though I’m not sure how the flavor will turn out for you. The skins of the ginger and turmeric are edible from what I’ve seen, but you may want to research that a bit. My biggest concern would be any chemicals on them from the store. Garlic can turn blue from interacting with lemon juice or some other source of copper (it forms copper sulfate). It is still edible that way, from what I’ve read. I think the best thing for you to do is give it a taste and see how you like it. Loved the info on the chili peppers!! Never knew that the variety was so large. I’m looking for some information about some of the exotics like the ghost and Carolina Reaper chili? I am trying to get hold of chili powder and finding it very difficult to get a hold of any of that in South Africa. Is there any way that you might be able to help? I have just discovered this site, lm a chilli nut. Living in UK now but grew alot of organic chilli in Cape Town to make sauces. Imported the seeds of Reaper,7 pot,trinidads etc and successfully grew them. Enjoy your recipes. I have tried quite a few. I was wondering if you could run a article with recipes for fish peppers. I made a nice hot sauce with them and was very pleased with the heat. Looking forward to all your future articles and recipes, thanks. Thanks, Jay. I’ll try to get my hands on some! Maybe I’ll try growing them this year.